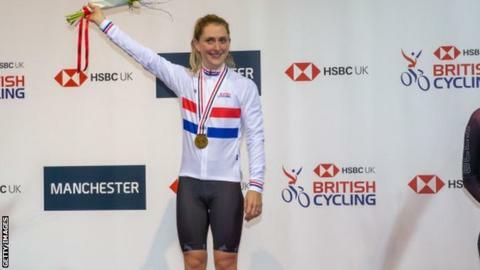 Olympic champion Laura Kenny will ride in the inaugural Six Day Series Manchester at the National Cycling Centre in March. Kenny, 26, will take part in the event – a mix of track racing and music for elite men and women and emerging junior talent – from 22-24 March. Racing will include the Madison, time trials, team eliminations, scratch races and points race. GB Olympic and Commonwealth champion Katie Archibald is also set to compete. Kenny, Britain’s most successful female Olympian of all time with four gold medals, said she is “excited” to make her debut in the competition. “Six Day is hugely competitive and mentally and physically challenging, so I hope the Manchester crowd really get behind the event, the riders,” said Kenny, who won gold in the scratch race at the British Track Championships in December. The racing takes place to a backdrop of music, provided by track-centre DJ, while the venue lighting is turned down to add to a “party atmosphere”. The competition, which usually takes place over six days, is one of two new events added to the 2018-19 series, which began in London in October 2018 at Lee Valley VeloPark.